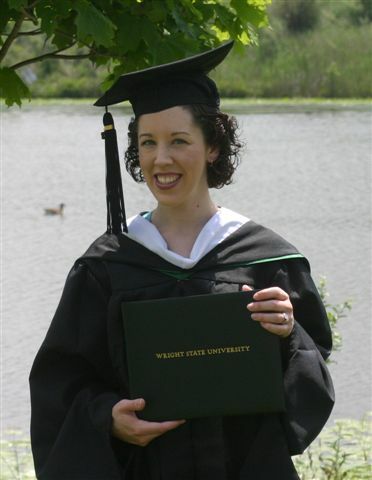 I graduated on June 14, 2008, with an Master of Arts in History, with Public History concentration (archival studies focus), from Wright State University in Dayton, Ohio. My studies included coursework in archival administration, preservation, manuscript processing, photograph preservation, oral history, museum studies and exhibits, records management, as well as a historical methods course and several American history graduate courses. A 100-hour project and 300-hour archival internship were also required. My project was updating the web pages of the University of Dayton archives with electronic finding aids. My internship was conducted in the Wright State University Special Collections & Archives in the summer of 2007. View Transcript: Wright State U., 2006-2008.